There are 17 reviews of Ofrésia. The opening is a clear and bright unequivocal freesia note, beautiful and made of very good quality ingredients. The white floral bouquet is direct and convincing, but not a completely soliflore without further development. At times hints of gardenia and muguet shine through. In the drydown a woodsy undertone develops that is more a green bushland vibe with leafy aspects. Later a light sweetish white peppery base appears as a counterweight to the initial floral basket. This spice is very mild and soft in character. On my skin the performance is very good with moderate sillage, very good projection and a great eight hours of longevity on my skin. A very nice scent for warmer spring days, and one of the Diptyques that convinces. 3.25/5. 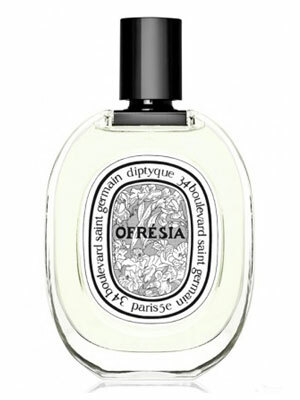 Ofrésia starts life with an intensely sweet citrus and floral accord that at first had me thinking “Oh great, Diptyque stoops to frooty floral.” Thank the perfume gods that the scent veers quickly toward the green, establishing within minutes a bright, buoyant green floral accord that chugs along almost unaltered for several hours (in true Diptyque linear fashion). I’m not so certain that it smells of freesia, but Ofrésia is a lovely, luminous composition that has me smiling as I wear it. If I were to compare Ofrésia with some classics in the green floral fragrance family, I’d look to Chanel’s No. 19 and Guerlain’s Chamade, both of which share the Diptyque’s air of sunlit spring mornings. Ofrésia’s green notes are less sharp and biting than No. 19’s, though, and its sweet-tart fruity dimension makes it more crisp and energetic than Chamade. As a thoroughly contemporary fragrance, Ofrésia also has a far simpler and more concise structure than its classic cousins: blocks of citrus, bright florals, and bittersweet herbaceous green notes laid side by side on a clean woody base, and not all that much else. A device does not have to be all that complex to work, however, and work Ofrésia does – at least for my nose. I’d have to call this out as an underappreciated gem in the Diptyque line and I recommend a sampling to both men* and women. Lovely. Utterly flowery, but not in that terrible, overly synthetic way most florals are nowadays. Ofrésia has surprising sillage and depth considering how light it seems at first. Dewy is a really good word to describe this. The opening is rather green with lilac-like floral tones. A honest, really simple but high-quality green take on fresia and peppery spices. Bright, refreshing and hearty like a walk in a flower shop. A well-made basic for all flower lovers. This fragrance is a testimony to the power of masterful simplicity. Freesia and pepper. That's it. And it is one of the most beautiful, delicate floral fragrances I've ever smelled. Like the summary on LuckyScent said--this perfume carries Diptyque's uncanny ability to capture not just the petals but the whole body, stem and roots and earth, of the flower at its heart. I normally can't wear florals because they are too much for me. But this is the floral for people who dislike florals. Light, fresh, and airy, perfect for a summer day (or any day). Received it as gift. The fresia note is way too strong for me, but like Jessica Grape's boyfriend mine loved it and always says it smells wonderfully on my skin. 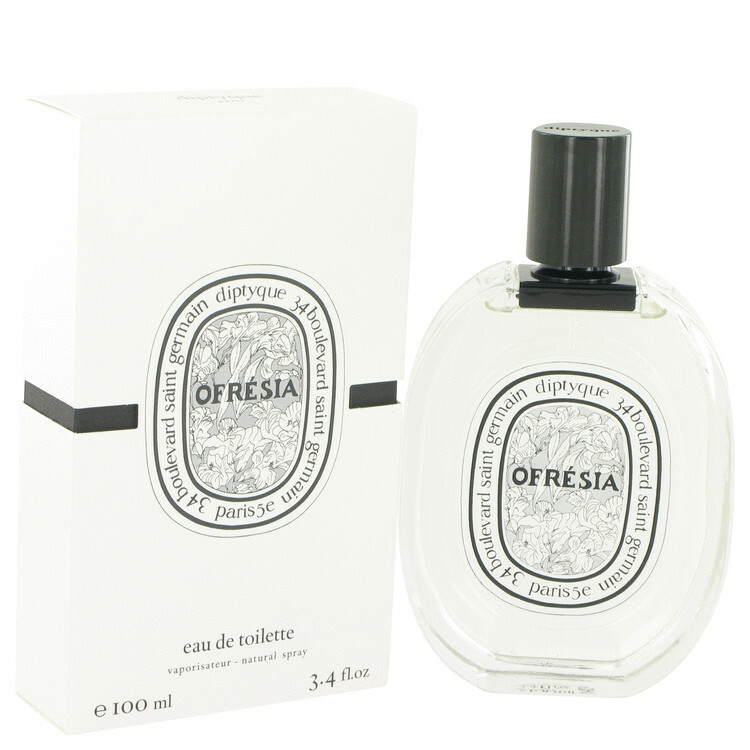 The floral notes are so extreme to me that I only wear a tiny bit of Ofresia. I am not a fan of floral intense fragrances and to me the green notes are overwhelmed by the freesia ones and speaking as a layman my nose only captures the flowers. I do wear it though but admit that it happens for the benefit of my fiancé. 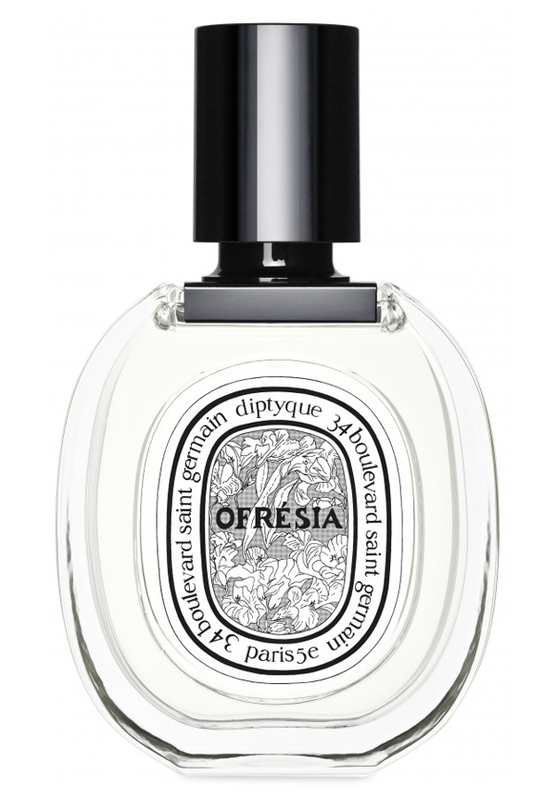 Diptyque Ofresia Eau de Toilette 100ml New with box. There are no member images of Ofrésia yet. Why not be the first?